Get ready for a new time management adventure with the Love Boat crew! Enjoy the next chapter in The Love Boat - Second Chances Platinum Edition, a brand-new time management adventure filled with romance, fun and, well… quite a bit of chaos. It’s up to you to juggle the many duties of a cruise director as you tend to each passenger’s needs! Just be sure to find time to enjoy the beautiful beaches of sunny Acapulco, and the luxuries on board the ship, as you sail from Los Angeles to Mexico on the cruise of a lifetime. Oh, and don’t forget the souvenirs! - Based on the hit TV show from the 80s! - Level up your crew to upgrade them, letting them help you more! - Play as different characters - each character has their own special talent! - Designed for mobile, so items are easier to see and select. - Sail through 60 levels, each with two additional special challenges! - Replay levels using different characters to beat the extra challenges. - Help move the story along with funny, interactive cut scenes. 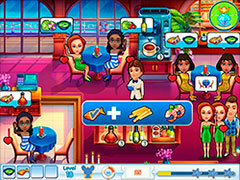 - Master 12 cruise-themed mini games and ace every level! - Laugh along with 4 fun story lines, one starring Sally and François! This will be a cruise like no other! Set sail on the Pacific to explore exotic locations, and go on excursions in the destination ports. Help the crew out as they face a myriad of pitfalls in this sitcom game! Julie is great at helping passengers with their “affairs of the heart”, but how will she deal with her own?... Bert wants to throw a birthday party for his wife – but she has other ideas! Doc is looking for romance, but has he found it in Helen? She may not be quite who she seems… The comedy continues with Sally and François, who round out the passenger list. However, word’s got out that these two are jinxed! Will they cause waves of destruction wherever they go, or is the crew only imagining things?